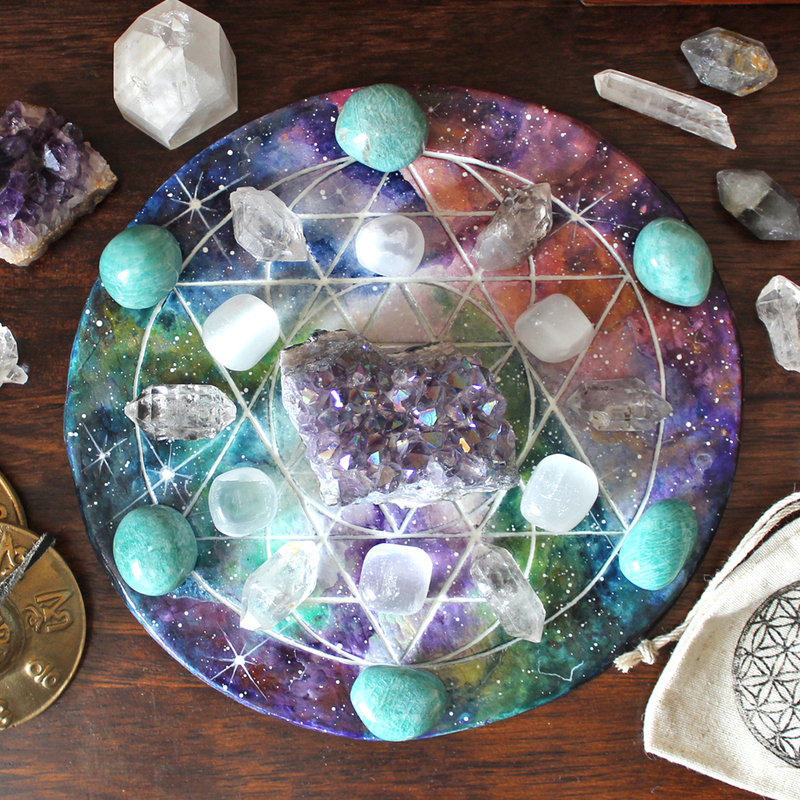 Do I Need a Crystal Grid Board, Template or Cloth? The short answer to this is no, but please read on. 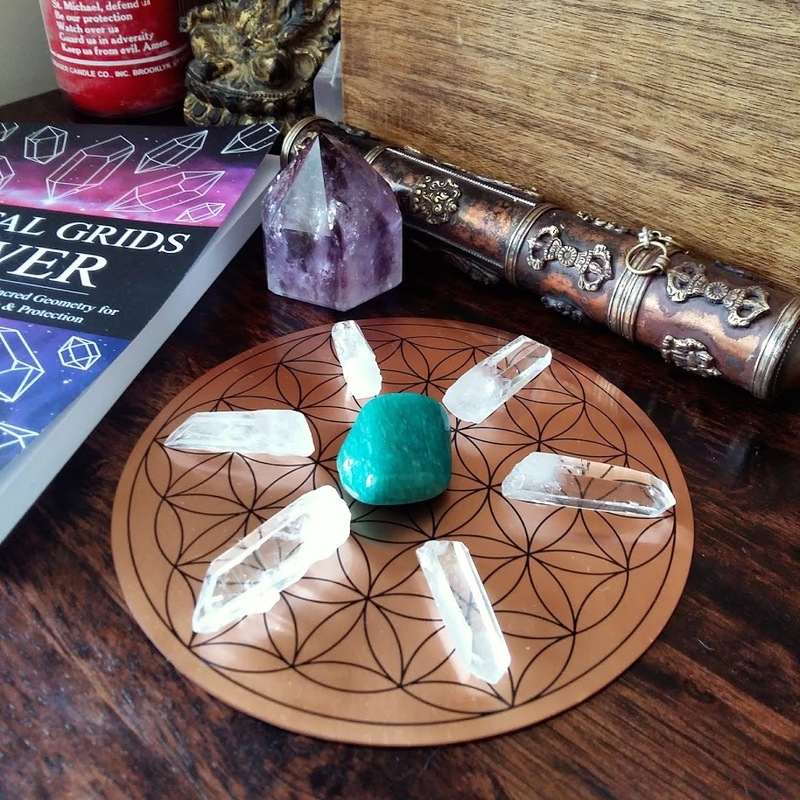 Crystal grids can be made straight on to any flat surface but a crystal grid template or base of some kind makes it a whole lot easier. I find the more complex the geometric pattern the harder it is to arrange the crystals without one. The template acts as a guide for the placement of your crystals (there is more about the meaning of the designs below). There are some geometric shapes such as the Flower of Life that are extremely difficult to reproduce with crystals alone. This is the ‘grid‘ part and it forms the energy pattern your crystals will work within. Please note the sacred geometry or symbols used will depend on the type of crystal grid you are making. I always select the geometry that aligns with my intention in the crystal grids I share here on my blog and in my books. It’s a massive topic. If you’re interested, I have a very detailed guide to using different sacred geometry symbols for your grids in my book Crystal Grids Power. As well as making constructing your crystal grids a lot easier and more accurate, there are other benefits. I find cleaning your crystal grid of any dust can be very tricky if you don’t have a template to put the crystals back into position. The solid Crystal Grid bases make moving your crystal grid easy. This allows you to move a grid if you decide to change the location. It’s also great if you’re cleaning, moving furniture or if you ever want to put your grid out of sight from someone. There are plenty of different ways to create a template from paper and card to wood or metals. Here is my guide to the different types and different materials, plus the pros and cons of each one. 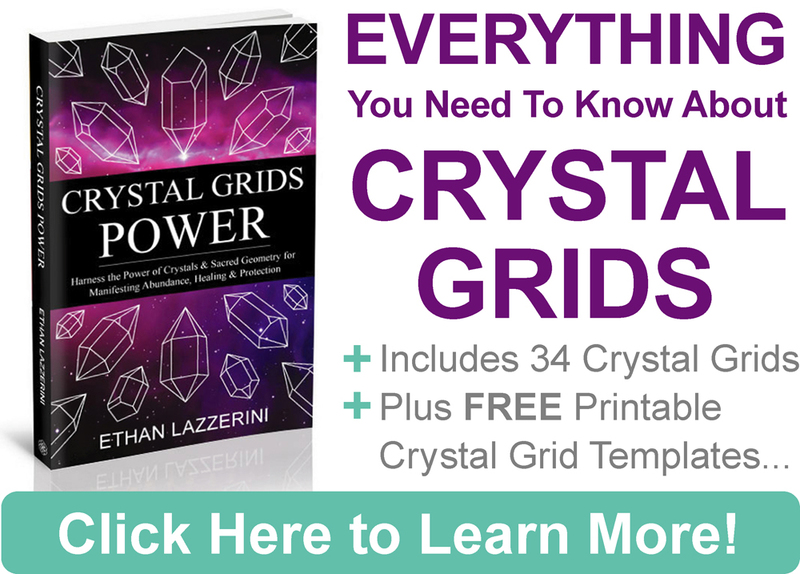 Crystal Grid Bases Explained – Pin this to Pinterest! These are usually in PDF format and can be printed on paper or card. Sometimes people make and sell printed grid templates with full- colour graphics which are laminated. They could even be drawn if you are good at that (I think I will give that a miss…). These are a great way to start gridding. They are the least expensive form of template. You will need a printer and I recommend that you use card. Printed crystal grid templates are not very durable, but they could be laminated to make them last longer. Printed grid templates can’t be used to easily move your grid. Some people might not like the white background or using a printout in their home. You can find them by searching online in blogs and websites. I include free ones in many of my blog posts. You also get a book of printable grid templates when you purchase my book Crystal Grids Power. Crystal Grid cloths or mats are where a geometric template is usually printed or embroidered onto a square piece of fabric or cloth. Different coloured fabrics or inks may add additional symbolic meanings for people. These are fairly inexpensive to buy and available in sets with the most common sacred geometry symbols. 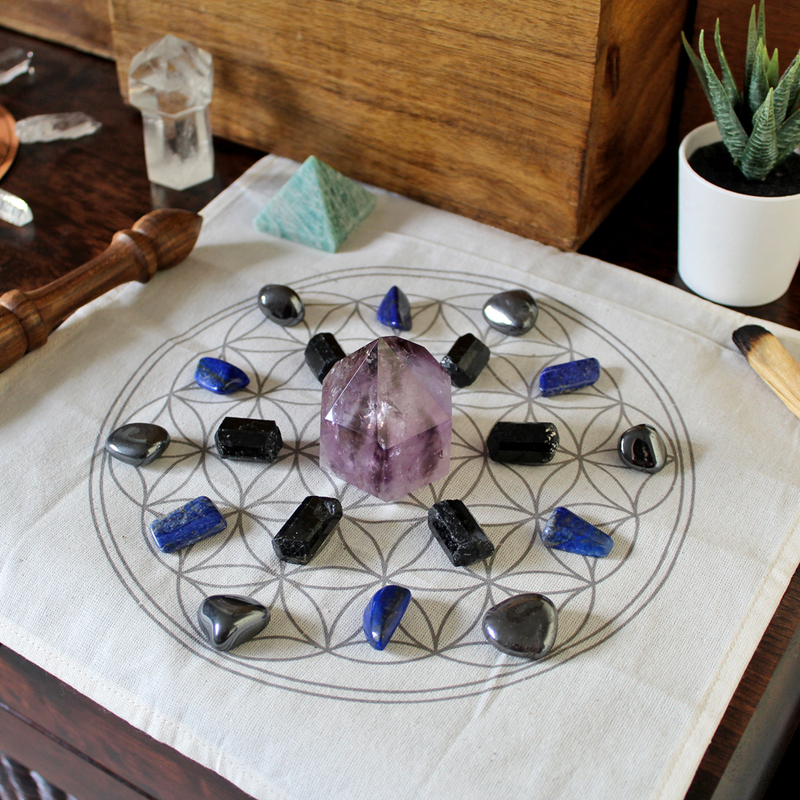 Crystal grid cloths can be folded for easy storage when not in use. They look great on display and can also double up as an altar cloth. Depending on the size of the cloth and the border you have, they can sometimes take up space when they are laid out. Cloths can also get disturbed by brushing by them. They can’t be used to move your grid if needed. Dust and dirt can show easily and they may need hand washing. One of the easiest ways to find handmade crystal grid cloths is on an online marketplace like Etsy. Always check the measurements and watch out for too much wasted space around the print. Wooden crystal grid bases are made by etching, printing, burning or sometimes painting a slice of wood with sacred geometry. These come in different shapes and sizes. Also, different woods can have meanings for people. 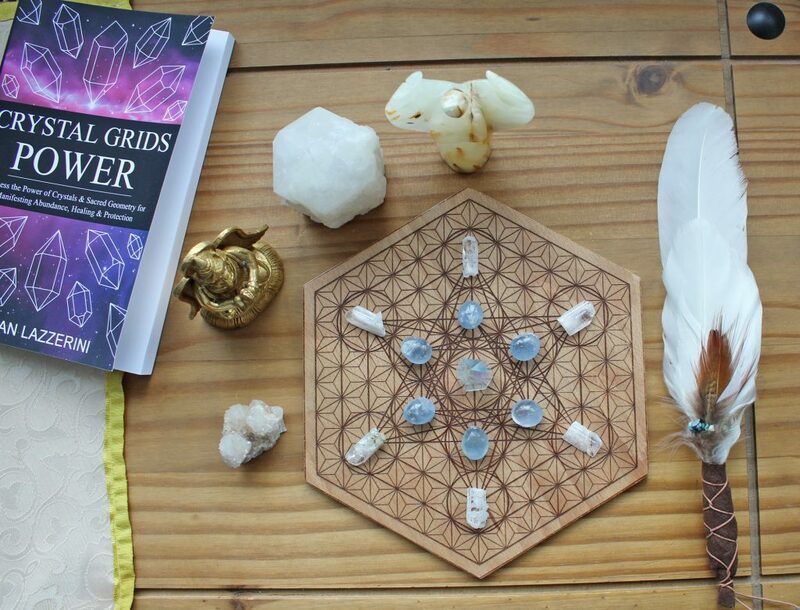 Well made crystal grid boards can look stunning. They create a steady base for your crystals and make moving your grid about easy. They are easy to wipe clean of dust. Wood is a naturally grounding material that can anchor the energy of your grid. There is lots of choice in colour and finish now available. 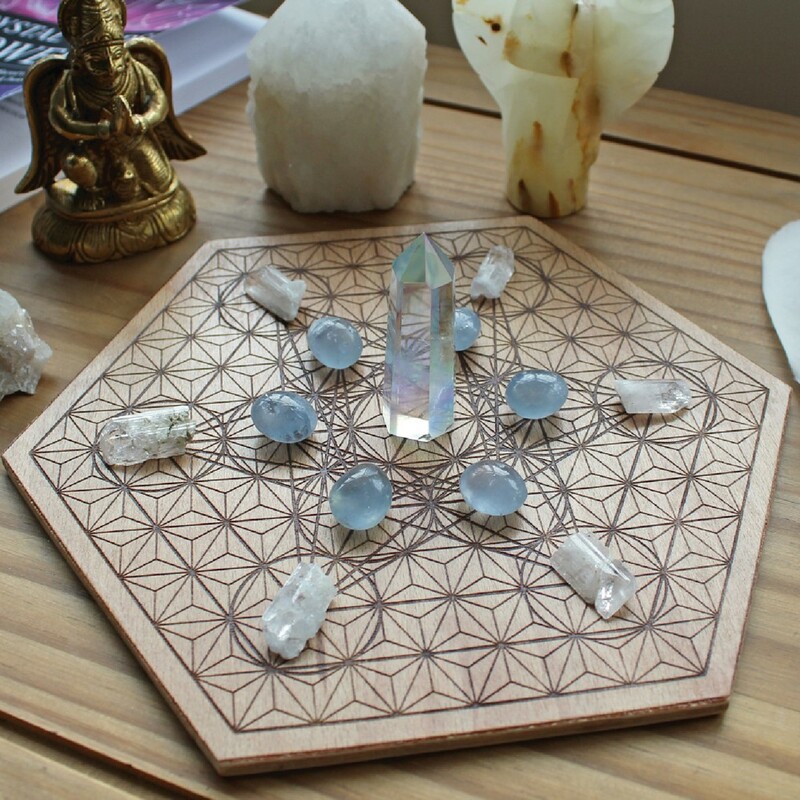 Crystal Grid Boards vary in price and can be quite expensive depending on the quality, finish, wood used and maker. If you have a few they can take up a bit of space. You can get Crystal Grid Boards on Etsy or specialist websites. I can personally recommend Fractal Roots Design, Cave & Canyon and Coppermoon Boutique for well-made grid boards. I wasn’t sure to include these and I do not currently own one. These are very rare and usually created by etching the geometry onto any type of stone or crystal. I have seen Quartz, Obsidian and Slate used. 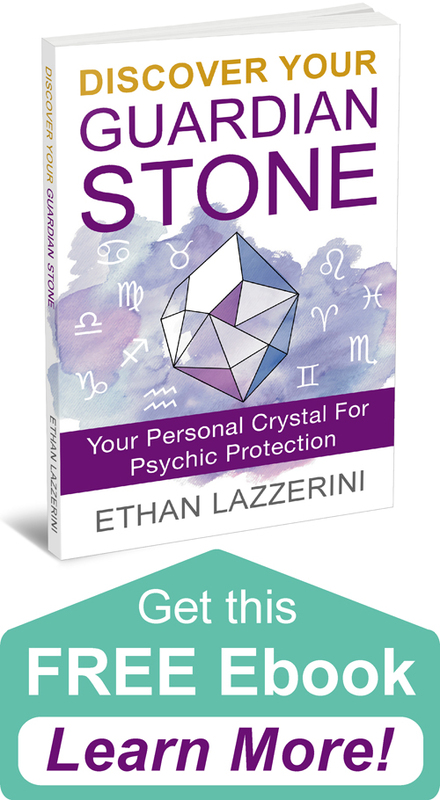 The type of stone used will add its properties to your crystal grid, adding an extra layer of energy to your grids. They are easy to clean and move about. The stone or crystal used may not suit all the crystal grids you wish to make. They are usually very expensive if gemstones are used. There is a lot less choice with these in terms of design and they are generally smaller in size. Other than specialist websites and crystal shops, you can find a few of them on Etsy. These are etched on to metals, most often Copper for its energy conducting properties and metaphysical uses. Brass will also work similarly and gold plated bases. They might be sold as ‘charging plates’. Copper, Brass and Gold Plated bases amplify the energy of your crystal grid. Metal also carries protective properties (like a shield). As they are solid, they are easy to clean and move if needed. They are not very easy to find and due to them being made of Copper and Gold they are usually expensive to buy, especially the larger ones. The price of Copper and precious metals continues to rise. If the Copper is not coated, they may tarnish over time. Ensure the underside has felt or other protective pads to avoid scratching furniture. Specialist crystal shops and websites may have them. I got mine from Shamans Crystal, where they are sold as ‘Energy Mandalas’. These are not easy to find but can be made yourself. They are a mirror with the sacred geometry etched, painted or transferred on to the surface. Alternatively, you could use a mirror without a frame or a mirror tile and arrange your crystals on to it. They have an interesting optical effect of doubling your crystals. Mirrors can be used to amplify the energy of your crystal grid. They may also be useful for grids for psychic protection, self-reflection and manifestation work. They are easy to clean and move. Small plain mirrors are inexpensive to buy. Ones with sacred geometry are not easy to find. When mirrors are laid flat they attract dust. Mirrors are fragile and will need regular cleaning to keep them bright. Ensure the underside has felt or other protective pads to avoid scratching furniture. A plain mirror or mirror tile can be found at most home stores or online. 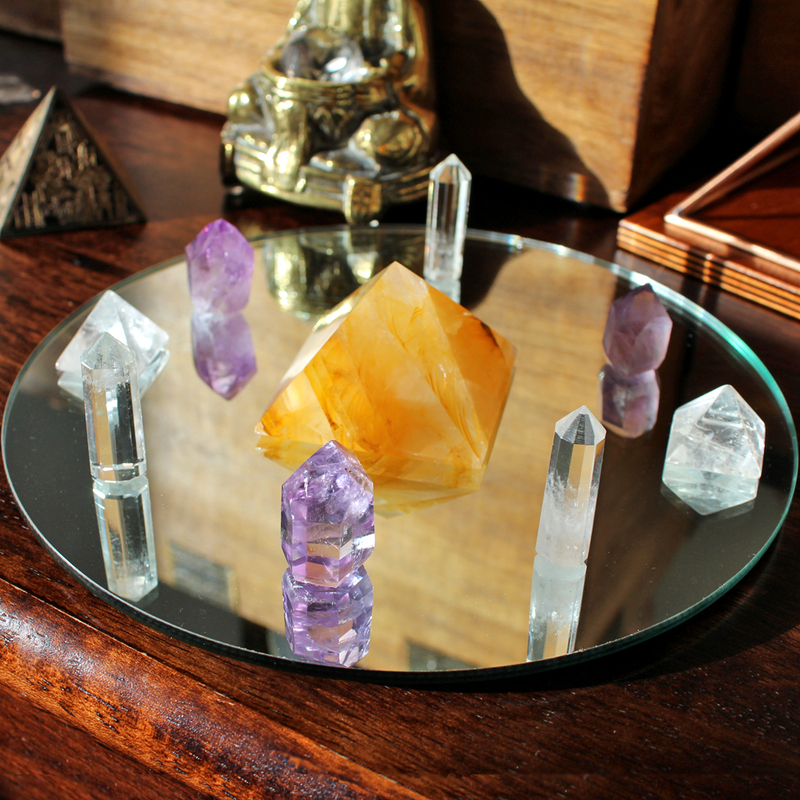 Mirror crystal grid bases can be found on specialist shops and websites. I have even seen them on Etsy from time to time. These are very unusual but I was gifted one. They may be made of materials like clay or china. They might be inscribed or painted with a glaze or paint. Ceramic plates or tiles with sacred geometry can also be used. 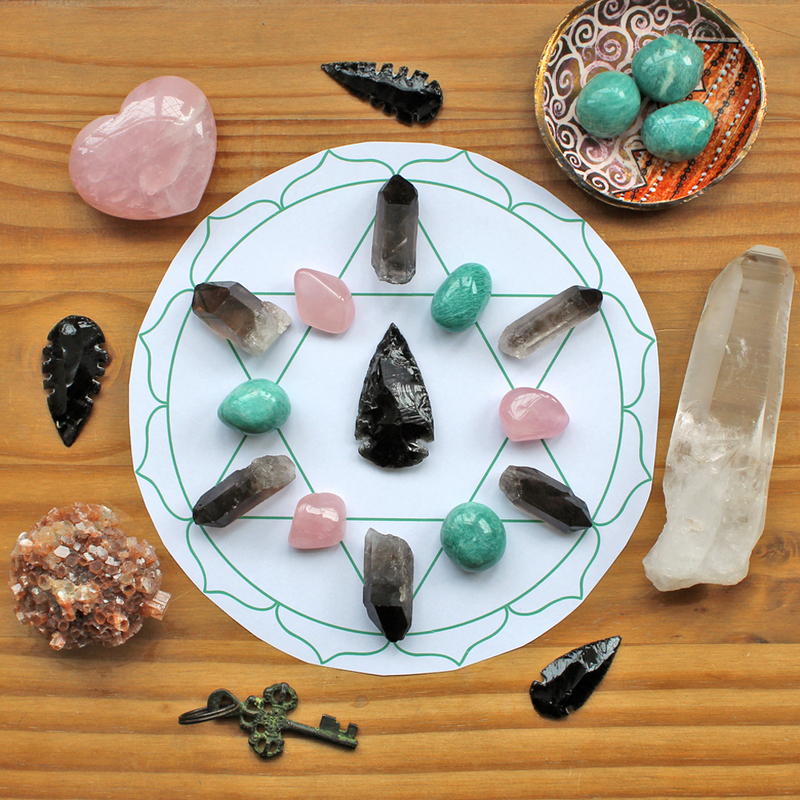 They add an earthy or grounding energy to your crystal grids. Ceramic grid bases are easy to clean and move if needed. You can make your own if you use ceramic paints on a plain tile. They are not easy to find. They are more fragile than some of the other bases, so should be treated with special care. I have seen a few ceramic grid bases, geometric plates and times on Etsy. I can recommend Handmaiduns for hand-painted original ceramic grids. Hopefully, this has helped you in choosing your crystal grid bases. Feel free to post any questions or comments you have below (please keep any questions you have concise and on topic if you want a response). 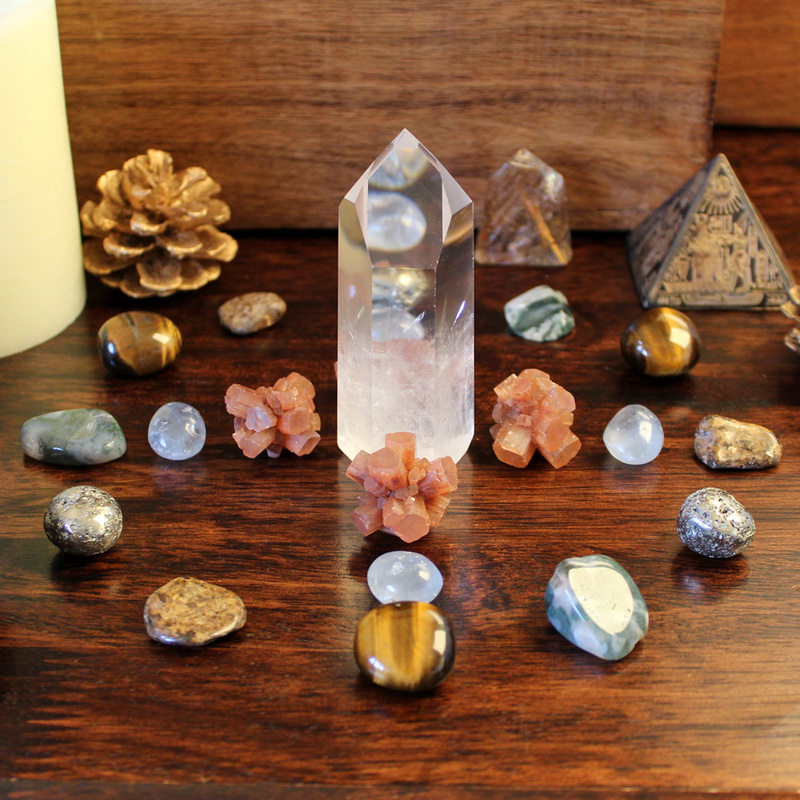 ← Should I Charge My Crystals? Thank you Ethan for this informative article.I have various grid boards that I use but the one that is made of wood I find is the most “natural”. Hard to explain but for me what feels right is better than what looks good at the begining but wanes over time. Have a great day! Great article Ethan, and handy to know where to get some of these items in the U.K. as US postage costs pretty prohibitive. 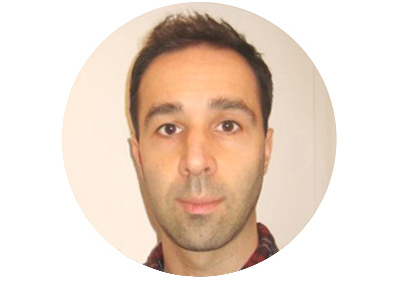 I love wooden grids because of their organic nature and it was interesting to read what you had to say about them. Hi, I bought a batch of inexpensive thin white cake boards to use as bases. They are rigid so are easy to move around. I print off the design of the grid I want to use (usually one of yours because I have your book), onto the colour of paper that supports the purpose of the grid i.e. blue for healing, and the crystals laid out on top. Okay I am going to print out the grid on card stock but can I use colored cardstock instead of white. What color cardstock would best help with manifesting for the year? You can do if you want but you don’t have to. Maybe yellow or a golden colour? Hi Carol, I know little about this type of grid because I have no experience with them and always make my own grids which are not wall mounted or glued. I can’t really comment or advise on crystal grids others have made. I think those that make and sell wall mounted grids are the best source for information and advice for maintaining them.